Need to repel opossums from your property in 2019? Then you've come to the right place! There are a few different types of repellents out there, but for our top pick, we kept things simple: Exterminator's Choice All Natural Rodent Defense Spray. Don't be fooled by its name! 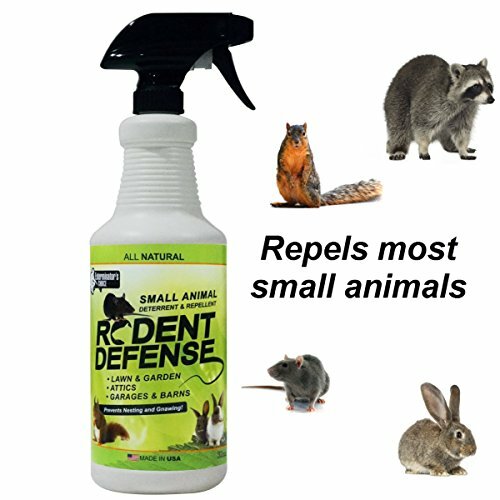 While this spray is marketed toward repelling rodents and squirrels, we find that it works to repel even the introverted opossum. Here's how it's effective: the active ingredients (a combination of garlic oil, peppermint oil, rosemary oil, and white pepper) swirl together and create a strong scent that an opossum can barely handle. This aroma will drive the animal away within a matter of a few days, leaving you with an opossum-free backyard in no time. Because the active ingredients are common kitchen staples, this spray is totally safe for use around pets and kids. What smells only marginally strange to the nose of a human is completely inhospitable to an opossum! In addition to opossums, this spray can repel many other types of smaller nuisance animals. As its name implies, rats and mice will flee, as well as squirrels, skunks, and possibly raccoons. This is a versatile spray that packs a punch for a minuscule price, which is why it takes the top spot on our list. We've got several other opossum repellents analyzed below, as well as a few key facts on what exactly a repellent is, and how to differentiate a repellent from a deterrent. Keep reading for more information! What Is an Opossum Repellent, Exactly? Repellent vs. Deterrent: What's the Difference? If you're not quite sure what a repellent actually does, you're not alone. Does it keep the opossums off your property in the first place? Does it make them go away once they're already there? For answers to these questions, continue reading below. Does a repellent prevent opossums? Opossum repellents work to make your yard or garden an unsuitable place to den. There are a few different types (which we list in the section below), but they all pretty much work in the same way: to hinder the opossum from wanting come into your backyard in the first place. By using a repellent, you're essentially safeguarding your outdoor area from an opossum infestation. Will a repellent make opossums go away? When an opossum perceives danger or becomes too irritated to stay in one place, it will move along to another, more suitable den area. Opossums are a nomadic species to begin with, so it doesn't take much to push them along toward a new place to live. Does a repellent make the opossum mad (and ready to strike)? Despite their mouthful of sharp teeth, opossums are unlikely to bite or pounce on a human in retaliation. Normally, their best defense is to roll over and play dead in the event that they see a person or an aggressive pet in their line of sight. They are able to slow their heart rate for up to two hours and appear totally lifeless in order to create the illusion that they are truly dead! So, are all opossum repellents created equal? While there are no specific repellents designed especially to keep opossums out, there are broad-spectrum rodent and nuisance-animal repellents which work to ward off these animals. Did you know that there's actually a market for real, live predator urine? It may sound unbelievable, but you can actually buy the waste products of foxes, coyotes, and other top contenders in the food chain! Why are these types of repellents so effective? Take a look at the explanation in the video below! These products work by manipulating the natural fear impulse of an opossum. By sprinkling granules infused with the urine (or sometimes spraying the urine itself), you're making the opossum believe that this vicious predator is actually out and about in the area. Within a matter of a few days, the opossum will give in to its natural passive instincts and pack up for safer areas. These small machines are designed to emit a high-frequency electronic wave through your yard which irritates the central nervous system of any pests in the vicinity. They are marketed for all garden insects and nuisance animals, so they're versatile enough to be used for many different types of unwanted guests in the backyard. Essentially, once you turn on these devices, a soundless and invisible wave will flow from the machine through your yard. The opossum will feel agitated in your backyard, and will find your property to be inhospitable. Click here for more information on ultrasonic machines. The two words seem to be interchangeable, but are they? What's the big difference between a repellent and a deterrent, anyway? At its core, the job of a repellent is to drive opossums away from a property. The substance or device can do this in any number of ways, as mentioned above. However, the basic goal is the same: once the opossum (or other pest) is there, a repellent's job is to rebuff it. A deterrent, on the other hand, prevents an opossum from taking up residents on your property in the first place. By using scare tactics like light, sound, and sometimes painful sensations, these products can make your backyard seem like an unsafe and unsuitable place for an opossum to build its den. The All Natural Rodent Defense Spray by Exterminators Choice takes the top spot on our list of opossum repellents because it combines function, affordability, and effectiveness. This spray is made from a combination of garlic oil, peppermint oil, rosemary oil, and white pepper as its active ingredients. Combined, these four blend together to create an aroma which is unpleasant to opossums and other nuisance animals alike—creating an inhospitable environment in any place this has been sprayed. Because there are no chemicals or rodenticides contained in this spray, it's completely legal for use in all states to repel opossums. It's safe to use around pets and kids, and despite its harsh scent for nuisance animals, there's no obvious smell to humans. We recommend this repellent to those who want a safe, all-natural way to repel the opossums that won't agitate their own noses. 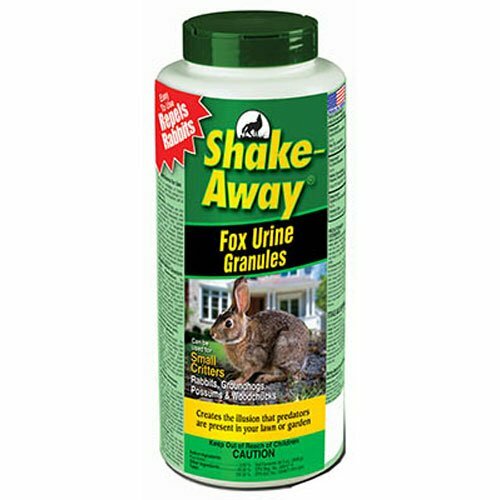 The Shake Away Fox Urine Granules are an excellent example of manipulating a natural instinct: one of prey fearing predator. Opossums are genetically programmed to fear foxes, and will instinctively flee any area where they believe that foxes live. Shake Away Fox Urine Granules make a point to take advantage of this natural loophole by offering a product infused with fox urine as to scare the opossums off of your property for good. Application of the granules is a breeze: simply shake the canister around the area where you've seen an opossum (or believe that one is hiding out). The smell is strong, and it will take over the area and quickly repel the opossum that's taken up residence on your property. These granules release the scent of fox urine over time, so as not to overpower an area all at once. Also, they won't harm your pets! They're safe and non-toxic for dogs and any other furry friends you may have in the yard, although the scent may scare pet cats. Like the fox urine granules above, Trap Shack Coyote Urine makes good use of the natural fear opossums feel toward the animals a few notches ahead of them in the food chain. 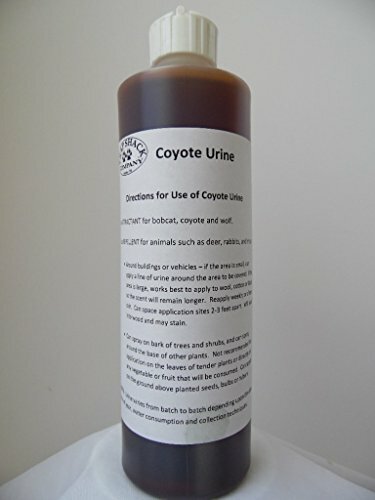 This urine is shipped in its original liquid form after collection from ranch-raised coyotes. The potency can vary from batch to batch depending on the animal's water intake and handling conditions. The feature that we really like about Trap Shack's Coyote Urine is that it repels a really wide array of different nuisance animals—not just opossums. If you have animals from squirrels to deer terrorizing your yard, this is the product for you. If there are a ton of different pests prowling around your property, we recommend that you give this product a try; it's all natural and straight from the source. Like the other options on the list, the P-Cover 100% Wolf Urine Granules manipulates the fear impulse of the opossum into believe that it's in mortal danger. Unlike its competitors, though, this product uses the urine of a wolf—one of the top predators on the food chain for an opossum. By design, this product is already more effective than its rivals. These granules work similarly to the Shake Away Fox Urine Granules in that they come in a canister used to shake onto your property in terms of application. Simply sprinkle for a few seconds around your yard, garbage area, or wherever you've spotted your opossum, and let the smell work its magic. We recommend this product as a chemical-free, all-natural way to repel opossums and keep them from coming back for good. 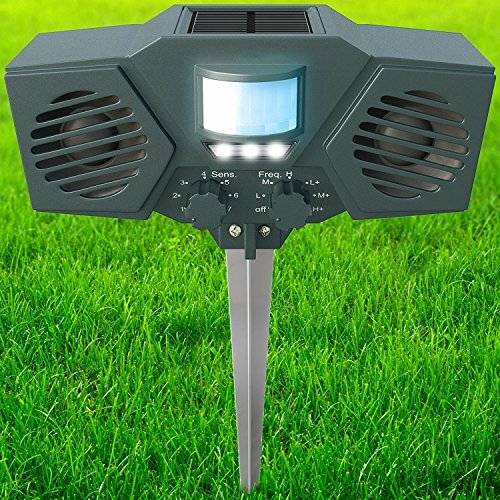 In contrast from the other items on the list, the PestZilla Robust Solar Power Ultrasonic Pest Repeller is an electronic device that uses ultrasonic waves to annoy pests out of your yard. This repelling device is mounted in your grass via the use of a stake and powered by batteries. Once you turn on the device, invisible, soundless waves are transmitted which irritate an opossum's central nervous system. Over a period of time, the opossum becomes annoyed by the waves, and will eventually move somewhere else, vacating your property. What we love about this repelling device is that it doesn't just work for opossums—you can use this machine to drive away squirrels, mice, spiders, roaches, and many more common pests. It's a little on the expensive side, but that's why it takes the final spot on our list. If you don't mind paying for quality, we recommend this product. It's an all-around awesome repeller, and you'll get your money's worth when it comes to the variety of pests you're going to be keeping away from your property. There are different ways to repel opossums, but the desired end result is always the same: an opossum-free backyard. You can repel other nuisance animals at the same time—maybe even some that you didn't know you had!